Find more names with the Search box on top of each page. If you have additional information, photos, or know of books and web pages discussing local people please Contact Allen INGenWeb. The Search box on the top of each page will find names and keyword search items on all of our pages. If you can supply biographical material on more people for these pages please Contact Allen INGenWeb. In May of 1997, Jeff Murphy started collectiong biographies of Allen County, Indiana people using the Kentucky Biographies Project as a model. State coordinators were sought to set up their own state project. They were offered the system design and tools created for the KY project, but were free to set up their project any way they chose. Volunteers were needed to enter, edit, and archive additional biographies for each project. Those biographies are included in these people pages as submitted. Many family histoires were included in the 2006 publication History of Fort Wayne & Allen County, Indiana 1700-2005 Volume 2 available at the Allen County Public Library. The Allen County, Indiana : Surnames page on Linkpendium has links to around 400 Allen County biographies in books on Internet Archive and Google ebooks online. Searching on the WorldCat Allen County Biography Bibliography finds dozens of Allen County books on biographies and people of Allen County, Indiana. History remembers only the celebrated, genealogy remembers them all - Lawrence Overmire from his Memorial page on Find A Grave. History isn't about dates and places and wars. It's about the people who filled the spaces between them. - Jodi Picoult posted October 18, 2017 by Amy Johnson Crow on Facebook. Standard atlas of Allen County, Indiana : including a plat book of the villages, cities and townships of the county ... patrons directory, reference business directory ... by Geo. A. Ogle & Co. in 1898 is a good book for early township maps and several pages of portraits of locally prominent citizens starting on page 94! ACGSI Records page has a growing list of indexed records for Allen County, Indiana. Cityscapes - People & Places is on the archives of The News-Sentinel newspaper. Family Web Sites of Allen County, Indiana is our list of local family web sites as well as how to find web sites that no longer exist via the Wayback Machine using automatic browser extensions to find those archived web pages. French Families of Allen County, Indiana at The Genealogy Center. Historical Record Lists has over 400 names of people who served such as ministers, mayors, state representaives and more prior to 1900 in Allen County and other counties in Indiana at OurFamilyTree.com. April 8, 2017 and August 11, 2017 general discussion of people from Fort Wayne were on You are positively from Fort Wayne, if you remember... Closed group on Facebook. We have a Surname Queries page where you can post names on our Submit a Surname Query page, or search already submitted names on our Query Index page. Genealogy of the Tragedies: Death and Sorrow in America Published on November 1, 2018 by Allen County Public Library on YouTube. Presented by the Genealogy Center at the Allen County Public Library. Every family has at least one tragedy in their family narrative. Let’s explore the process of researching some of these tragedies and how you can apply these same methods to your family history research. Indiana Artists More than 1,000 entries compiled from the "Indiana Artists" clipping folder of the Indiana Collection Vertical File (which no longer exists). Lasting Lawyer Legacy Project currently has the most videos of local attorneys. Information not in the history books was one heading in the article Allen County Bar Association project collects oral histories from the legal community by Marilyn Odendahl published August 9, 2017 on The Indiana Lawyer.com. Life Stories Your Story, Our History, Told By You at the Allen County Public Library. 1860 Lawyers from Livingston's United States Law Register published in the December 5, 1894 Fort Wayne Weekly Sentinel newspaper on the original Great Memories and History of Fort Wayne, Indiana page on Facebook. 108 year old resident: Irene Alma Steiss Burgoon Mensalvas died September 11, 2012. She lived on Ferguson Road farm that became part of Fort Wayne International Airport, lived in Hawaii, several states, a couple other countries before returning to Fort Wayne. From her Fort Wayne Newspapers Legacy.com obituary. A Brief History of Brewing in Fort Wayne, Indiana on the Wayback Machine formerly IndianaBeer.com. Business People magazine started their online digital edition in April 2019. Dialects and 4 part tongue in cheek YouTubeHow To Speak Hoosier video links discussed August 10, 2017 on You are positively from Fort Wayne, if you remember... Closed group on Facebook. Some of the video comments indicate some of these dialects are fading away and not state wide. First Name Abbreviations In many historic documents, first names were abbreviated. For example, old street directories and city directories always abbreviated common first names. Parish records often abbreviated familiar Christian names. This was done to save space and paper. From Genealogy In Time archived on the Wayback Machine. Founders Online CORRESPONDENCE AND OTHER WRITINGS OF SIX MAJOR SHAPERS OF THE UNITED STATES: George Washington, Benjamin Franklin, John Adams (and family), Thomas Jefferson, Alexander Hamilton, and James Madison. Over 182,000 searchable documents, fully annotated, from the authoritative Founding Fathers Papers projects. At The National Archives. Discussed April 4, 2019 on the National Historical Publications and Records CommissionFacebook page. FORT WAYNE FIVE: Important medical figures published April 9, 2018 in The News-Sentinel newspaper. Historical Databases of over 18,000 19th-20th Century Indiana Physicians and over 9,000 Union Civil War Surgeons at Ruth Lilly Medical Library at Indiana University of Medicine. 14 Doctors of Allen County search results. Hoosiers: The Story of Indiana four-part video series explores Indiana’s 200-year history. Based on the definitive history of Indiana, Hoosiers: A New History of Indiana, by James Madison. Produced by WFYI Public Media. The book Legendary Locals of Fort Wayne by Randy Harter and Craig Hartman is about 182 well known Fort Wayne locals released August 31, 2015 and nnounced July 16, 2015 on Indiana News 1 formerly You know you've lived in Fort Wayne too long when... Facebook group. Fort Wayne researcher on quest to find 'One Hundred Leading Hoosiers 1816-1916' Fort Wayne woman is trying to track down all of the people profiled in the 1916 newspaper series “One Hundred Leading Hoosiers 1816-1916,” which highlighted people who made major contributions to the state. by Kevin Kilbane published February 4, 2016 in The News-Sentinel newspaper . Legends of Fort Wayne. Over 400 comments December 28, 2017 on I grew up in Fort Wayne, Indiana on Facebook. Linkpendium has links to over 9 million surnames worldwide including 160,000 recently added free online biographies according to their November 21, 2015 Facebook post. Little-known women influenced city by Michael Hawfield in Cityscapes from the archives of The News-Sentinel newspaper. Most Popular People Born In "Fort Wayne/ Indiana/ USA" lists over 120 people with some claim to fame with Fort Wayne connections on IMDb.com. Old Settlers and pioneers in Indiana by Indiana Division Librarian Andrea Glenn published December 6, 2017 on Indiana State Library blog. Fort Wayne media personalities discussed August 16, 2017 on You are positively from Fort Wayne, if you remember... Closed group on Facebook. Surname spellings were often based on what the writer heard, rather than standard English grammar and spelling. Discussed in this blog North American Dialects and Fonetik Speling by Michael J. Leclerc's Genealogy News May 9, 2013 on the Wayback Machine for Mocavo about the North American English Dialects, Based on Pronunciation Patterns Rick Aschmann outlines eight dialects in North America. Discussed again as Where to Find the Best Collections of Regional Dialects and Local Accents by Nick Douglas September 7, 2017 on lifehacker.com. A common myth is some of our ancestors changed the spelling of their name at Ellis Island. Read: Ellis Island -- Names were NOT changed! A very persistent myth perpetuated in our genealogical world ... on the July 10, 2013 National Genealogical Society blog. USGenWeb has a list of Common Nicknames . People from Fort Wayne and Allen County on Wikipedia, the free encyclopedia. Portraits in the Grand Staircase - portraits of Sam Hanna, Samuel Foster, and Major-General Henry Lawton by Carmen Doyle published September 24, 2014 in the History Center Notes & Queries blog. 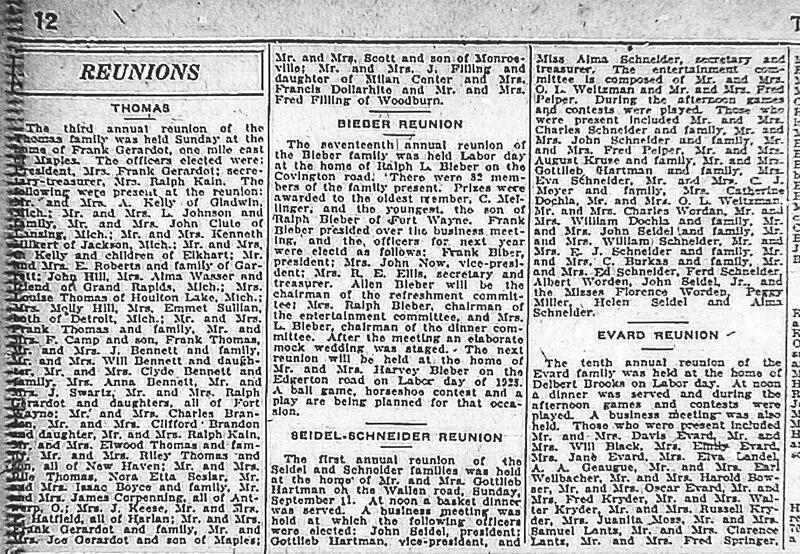 Reunions - early newspapers published lists of names of people who attended such as this September 14, 1927 newspaper for Reunions of the Thomas, Bieber, Seidel-Schneider and Evard families. Social Security Administration Top 10 Baby Names have look up by decade and state. Why is HE so important? (A brief reason why some things in Fort Wayne were named that) (The dead guys with streets and places named after them) by Carmen Doyle published December 24, 2013 in the History Center Notes & Queries blog. Writing Her Story annually since 2013 by the Indiana Commission for Women. In 1966, the famous “Blue Light Special” was invented by a Kmart manager in Fort Wayne, Indiana, who was seeking a way to make it easier for his customers to find the Christmas wrapping paper that he was clearing; the Blue Light Special went on to be adopted chainwide and become an American icon. Copied from Kmart Corporation on Encyclopdia.com. Movies made here or about Fort Wayne. Television shows with a real or fictional character from Fort Wayne. Over 900 pages of Biographical Sketches in Memorial record of northeastern Indiana published in 1896 by Lewis Publishing Company of Chicago. The Key to the Fort goes to individuals who’ve made an extraordinary commitment to the community through a lifetime of stewardship and involvement. The Key is a hand forged replica of the iron key that was at the Fort in the days of Anthony Wayne, circa 1790. The original key is at the History Center. Recipients include the late Charles Redd, a former City Council member and community activist, the late Jane Avery of Community Harvest Food Bank of Northeast Indiana, Bob Chase, legendary Fort Wayne Komets broadcaster and WOWO personality, Belinda Lewis of Animal Care and Control.